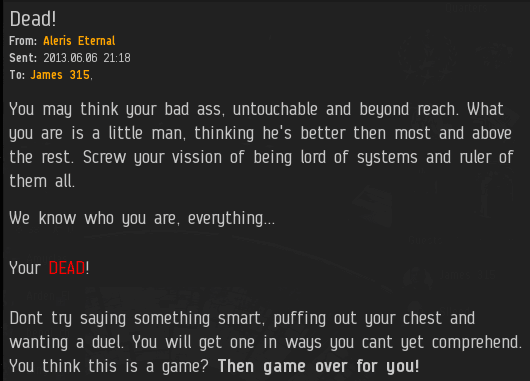 Aleris Eternal knows who I am, as you should you: I'm the Saviour of Highsec. And you should know what this is, too: Another edition of the Highsec Miner Grab Bag! Remember when CCP got DDoS'ed? Well, the angry carebear detective squad is on the case. 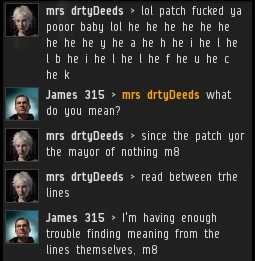 They're convinced that it was the New Order trying to ruin things for the highsec miners. Way back in October, I addressed the carebears' claims that the Retribution expansion would destroy the New Order. mrs drtyDeeds is keeping the tradition alive, and thinks Odyssey did away with us. 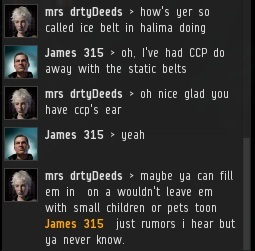 I'm not sure what drtyDeeds is saying, but I'll happily take credit for the fact that CCP made highsec ice less AFK'able. Who else but the New Order was leading the charge on that front? Of course, we've still got a long way to go. A miner who violates even 1% of the Code is still a bot-aspirant by any standard. Peit Dowkol apparently wrote me some EVEmail a couple weeks ago and wrote a follow-up complaining that I didn't respond to the first one. The thing is, I get a lot of EVEmail. Like, a lot. Everyone wants a piece of me. I don't respond to most of my mail, but I read all or substantially all of it. Binary Zombie warned me that my Agents are griefers by definition. But the definition of griefer isn't "someone who kills miners without considering cost or sec status". That is the definition of a hero. See also: Gallantry. One of the reasons it's so rewarding to bump miners is that even after all this time, there's still much we can learn from them. Though I personally retired from scamming some years ago, I respect the right of scammers to ply their trade. Scammers are some of the friendliest people you'll ever meet. Of course, Thomas Jefferson was asked to write the Declaration. I, too, was asked to write the Code. The highsec community implicitly asked me to write it, because who else would? 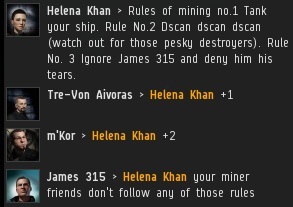 I'm not sure which of Helena Khan's three rules of mining gets violated the most. It should come as no surprise that her rules get broken so often. 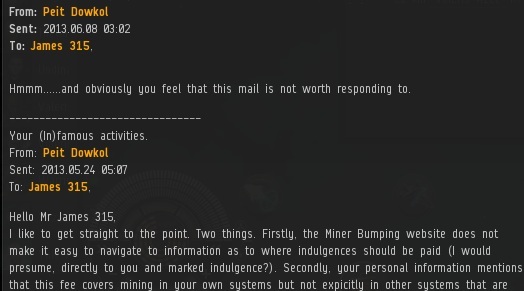 If miners can't even get the official rules of highsec straight, what do you expect? Even when I'm particularly generous with people, the enemies of the New Order will twist my words and actions to make it seem like I'm a villain. For example, a miner who goes AFK must dock up first, but if they ask an Agent, sometimes they'll be given permission to go to the bathroom. Similarly, I might grant someone leave to make use of telephonic equipment without docking up. Watch the rebels spin this thoughtful accommodation into an act of arrogance on my part! Some miners are happy to see us do battle against the bots, but they're less happy when they learn about the tax provision in the Code. The Code is not a buffet, my friend. You can't pick and choose which provisions you want to obey. The same authority that grants Agents leave to destroy bots also grants them authority to extract a mining fee. It's all or nothing! As with any form of entertainment, EVE isn't for everyone. Our Agents help miners discover if EVE is right for them. 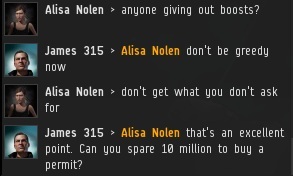 Can you imagine the tragedy of someone mining in highsec for years on end without realizing that they don't belong in EVE? 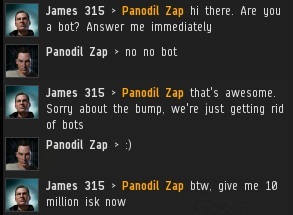 See on the one hand I quite admire that some people are so dedicated to the isk value of the ships they're losing, or the ice they're being bumped away from. But then I realise the equiv dollar value is about 5 dollars for an exhumer or less than a dollar for a barge, and that people are actually issuing death threats. Actual death threats over a few dollars. Can you imagine standing in front of a judge and saying "yes I did kill him. He took the equivalent of 5 dollars away from me". 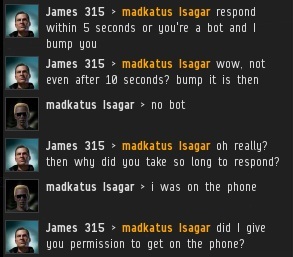 To be honest James, I think you're getting a little too power-hungry when it comes to looking for bots. "Sorry was on the phone"
"did I give you permission to be on the phone?" That's a red flag in my eyes there. It started from asking permission to use the bathroom, to now this. The savior of hisec has always required his subjects to monitor and respond in local. Nothing has changed. Questioning the father of the New Order in such a tone should require a fine. I suggest, Pootis Man, that you offer to pay James for your transgressions instead of waiting for an agent to come knocking on your hull. 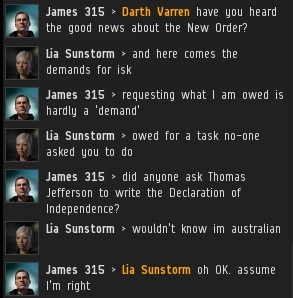 Yes, I know James has always required miners to have permission for something. I'm aware nothing has changed. It just seems that to me that it's kinda overextending it. That's funny, because I am an Agent. I bump and suicide-gank. I am loyal to the New Order and our Father James 315. Yes, it may seem I am not because I had questioned his actions, but I am a loyal one, no less. Being around since the time of the New Order's founding, I have seen many praises and doubts, but in the end, when the final battle for Hisec arises, The New Order will claim victor, and I will be fighting along side my fellow Agents. I think you should see it from another perspective. He's not giving permission to do things in real life. He's giving permission to do things in real life without docking the mining ship. Miners in New Order territory can dock and then do whatever they please outside the game, but if they don't dock and keep mining while going to the bathroom or answering the phone then they're mining AFK. It's not different from the usual bumping or ganking of AFK miners. It's not power-hungry, it closes a loophole. If answering the phone were pardonable, you would see a large increase in the number of miners away "answering the phone". No hard feelings, it's just a bad world. Pootis is a good agent, an effective Knight, a loyal upholder of the Code, and is entitled to his own opinion. He may want to consider a more appropriate forum for voicing it than public minerbumping posts, but that is his prerogative. Don't you see?!? Squabbling amongst ourselves is exactly what the bot-aspirants want! The Code unites! It does not divide! Well said Galaxy Pig! Here's to the Code!